THE DETROIT NEWS, Nov. 14, 1962 Ftpg. 3 line, 1 col. head: "Film Ducks Race Issue, Star Says" re. 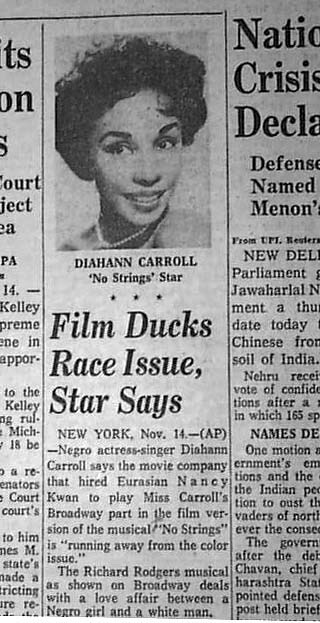 Diahann Carroll talks about a film that cast an Asian actress to star in the movie version of the Broadway musical "No Strings" which had a love affair between a white man & a black woman. Talk about the lack of roles for black actresses too. One col. photo of Carroll above the heads. Binding holes at the left. Two ink stamps in the masthead.